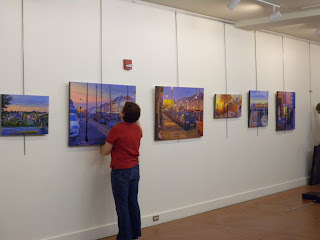 On the wall directly opposite my paintings are Jane Hahler's cityscapes. Both Jane and I like our color on steroids and I think it was a wise decision to have us opposite one another. It balances the room. 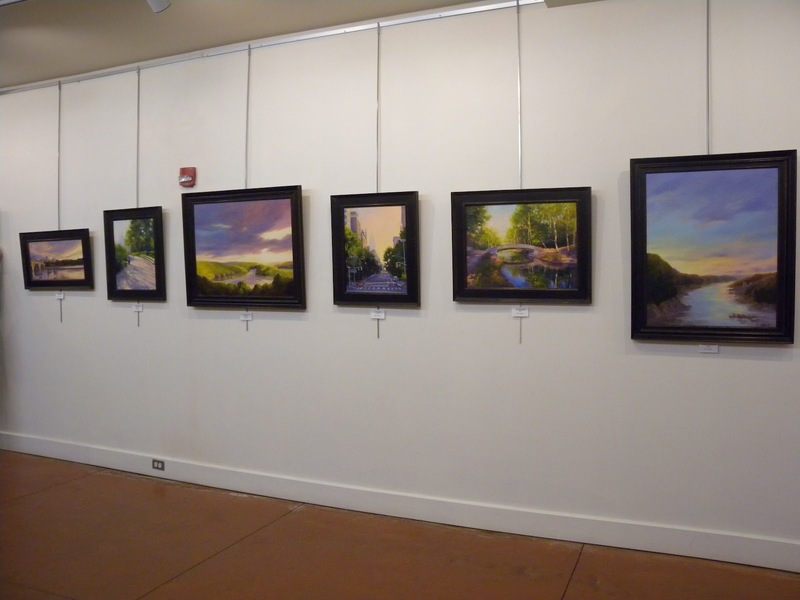 Jane is also and Art Leaguer and was one of our solo exhibitors a couple of years back. 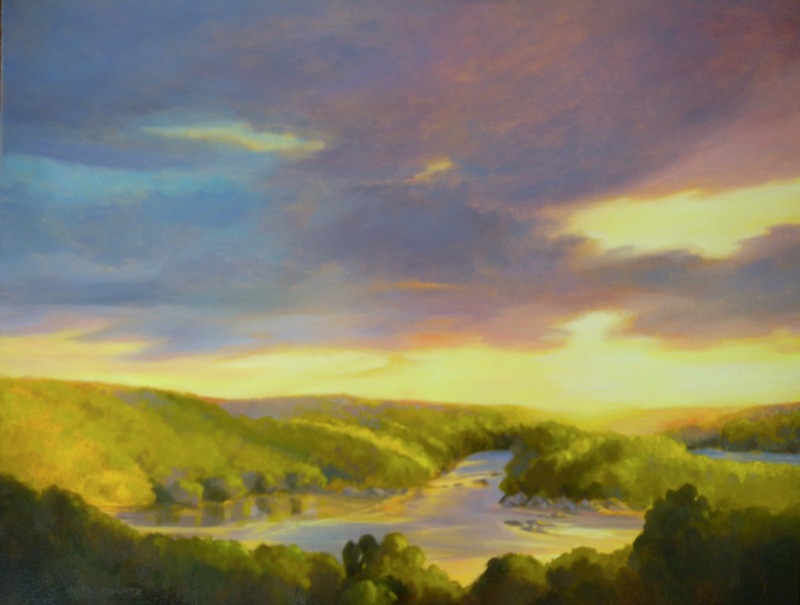 Below is Bobbi Pratte who is on the faculty at the Art League School. 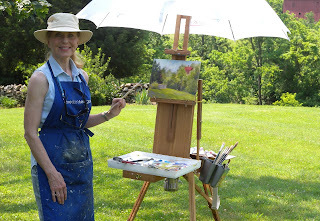 Bobbi is also a fellow ALPAP (Art League Plein Air Painter) and I will be attending her workshop at the Pennsylvania Lavender Festival for two days at the end of June. Seventeen of us are going and it will be FUN! Yesterday I posted about the Washington Society of Landscape Painters paint out in Middleburg on Sunday and I forgot to add the link. It is http://wslp.org/ If you hit paint outs on the menu you can see photos of the paintouts from the last couple of years. The history of the group is quite interesting and in the beginning it was men only! WHAT WERE THEY THINKING? Well, it was founded in 1917 and I guess they just didn't know any better. I did play around with the painting from Sunday and I improved some things and botched others. I will post it another time and I will keep it as a learning experience. I want to experiment on it and I'll talk about that later. If you live in the greater Washington area please consider yourself invited to the opening reception at the Ratner Museum this Sunday, June 3rd. 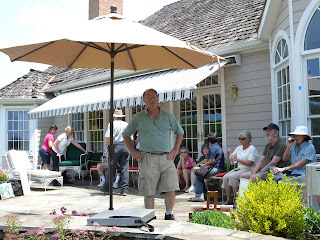 It is from 1:30 to 3:30 and you can see some wonderful paintings and have plenty to eat and drink! The address is 1001 Old Georgetown Road, Bethesda, MD. Here I am painting on Sunday in one of my favorite towns, Middleburg Virginia. 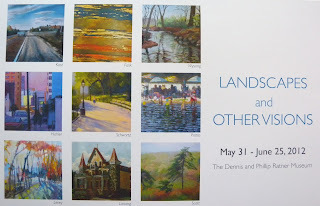 I was in town with 16 other painters all members or guests of the Washington Society of Landscape Painters. I am a guest and a candidate for membership and as such I am able to participate in any of the monthly paint outs. I try to do as many as possible and enjoy being with this great group of people. 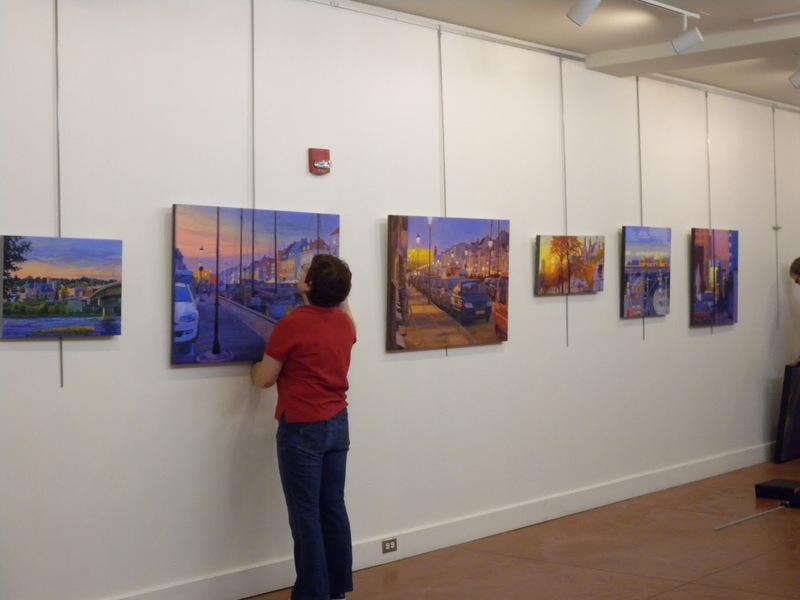 The WSLP is one of the oldest painting clubs in the country and membership is kept to 40. Membership is for life or until someone moves away or leaves for other reasons. I think it will be a few years before I can be considered for full membership. I arrived in town early because I didn't know where I wanted to paint. I drove around for awhile and didn't see anyone else. When I passed this beautiful, historic cemetary I turned around and pulled in. What a great idea for Memorial Day! Little American flags had been placed over the brass markers that lay flush to the ground. The feeling is really more of a park setting than a cemetary. No matter what direction I faced there was something interesting to paint. I settled on this view as my eye was drawn to the enormous red barn that was on the edge of the property. Web Bryant, who is also a guest and candidate, was attracted to the cemetary as well and had the same thought about Memorial Day. We set up in close proximity to one another. It is always more fun to have someone there to paint with. As it turns out the group scattered far and wide! Web's focus was on one of the most enormous oak trees I have ever seen. Honestly the trunk looked like it belonged on a sequoia! Web has a book on the historic trees of Virginia and he is going to let me know if the one he is painting is listed. We figure it has to be at least 19th century. 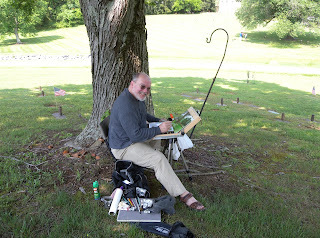 Web and I are also members of the Art League Plein Air Painters and we both agreed that we should get that group out to Middleburg as we want to take a crack at a different view in the cemetary. 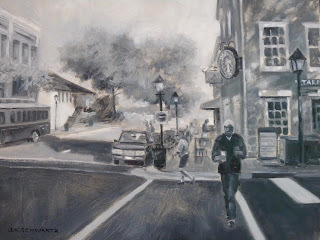 The problem with Middleburg is there are so many things to paint it is hard to settle down and pick one. I really would like to paint the Swedenburg Winery which is just outside town. That will be stupendous in the fall! We stopped painting at 11:30 (really hard to quit) as the group had been invited to member Sarita Moffet's house in Middleburg for lunch. Usually we brown bag it and eat while critiquing paintings. Today was different and Sarita treated all of us to a delicious and most generous lunch! Her home is beautiful. Afterward we all headed out to the patio and leaned our paintings against the wall for the usual critique. There were some wonderful paintings to see and as usual it is interesting to see all the different styles, palettes and takes on similar subjects. I had mixed all my own greens and thought I had toned them down from the overwhelming emerald green of the actual site. 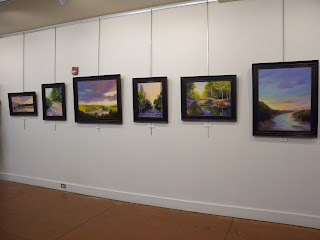 When I saw my painting next to the others I realized I have some work to do in that area. I looked at mine and I thought Kermit! Seriously, that is the thought that went through my head. Kermit the Frog would have blended right into my painting:) I loved the grayed greens and atmosphere in Mark Ingraham's paintings (he is my sponsor for the WSLP) and others managed to express the green without being too much so. It didn't seem to bother the others as they were more focused on the red barn which they felt needed some work. It looked plastered on. I received some good advice about toning down the color and letting some of the barn show through sky holes in the trees. They also suggested more reddish tones in the wall to tie the painting together. The composition is good but the painting needs some serious tweaking. I'll post it when I have done so. Today's painting is another in my series of small black and white or sepia and white paintings. I am finding these both fun and convenient to do. I say convenient because I can work on them in my studio under any light conditions which, given my schedule right now, is really helpful. They are also a good foil to my intensely colored recent work. Today was a great day to have been in the mood for a black and white because the day started bright but by afternoon the skies turned dark and we had quite a storm. I flipped on the lights and just kept going. I am sure there is a better way to upload an image of this card but for the sake of expediency I just photographed the front and put it up here. As you can gather from my lack of posts lately, I have been busy. Part of what is keeping me busy is preparing for this show. I do my own framing and it is also time to start addressing these invitations and preparing an e-blast invitation as well. Thank goodness I have plenty of paintings and the day we hang the show I will bring more than I need and see what works best. As you can see there are nine of us and the space has not yet been divided up. Here on the left is the finished version of "May Morning Above the Potomac". Like I said, there were just minor things to tweak and you will have to look carefully to see the adjustments. It is almost dry enough to blast with a layer of retouch varnish and frame. This will be the last I frame for the Ratner show but it is not certain I will exhibit it. It all depends on how much space I will have. I am giving myself options by bringing two small plein air paintings that also work with the group. I may eliminate this one and hang the two smaller works one over the other. I hope there is enough space because I rather like this painting and it looks good with the others. I get asked about my frames a lot and want to give some information here. 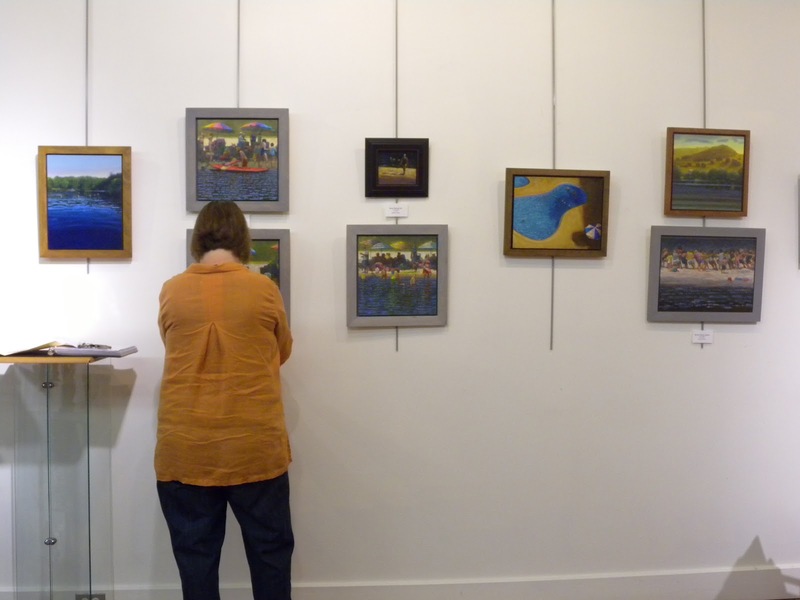 I have a wonderful framer in Falls Church Art and Frame and when I do 1.5 inch deep, gallery wrap canvases I like to have them float framed. I have those custom framed by Falls Church A&F because I just don't do it as well myself. However, even with the extremely generous discount offered to me I find that with the volume of paintings I have to frame I need to do most myself. Working on panels or standard 3/4 inch deep canvases gives me tons of options. The two companies I order ready made frames from are Florida Frames and Classic Frames in Vancouver Canada. Both companies are stellar. Delivery is quick, quality is extremely good and I have never received a damaged frame. The savings are huge! I use offset clamps and with an electric screwdriver I find I can quickly pop in a painting and secure it. I then cover the back with paper which protects walls from the screw heads on the clamps, wire it and I am good to go. When I frame this painting I will photograph it framed so you can see how it looks. I already have the others wrapped to travel but will upload images after we hang the show. I am being consistent with my frames and all will be framed in espresso colored, 3 inch wood frames with hand rubbed gold highlights. More news tomorrow......I hope. Happy Mother's Day to all the great moms who should be celebrated! This may be the longest spell between posts since beginning this blog! Everything is fine and I have been painting but I have also been very involved with a fundraiser for the Art League of Alexandria. I spent a lot of time on the computer with emails and FB posts. Those generated a lot of emails in my inbox that required answers and I tend to do such things at night. By the time I finished I wasn't much in the mood for posting anything. 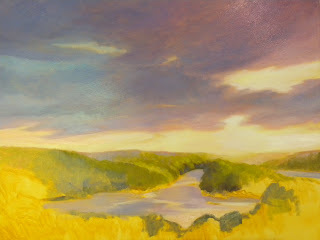 Above is my current studio painting after today's work. There isn't much more to do and tomorrow I intend to finish it. The rocks need some detailing and possibly I will add a little variation in the foreground. 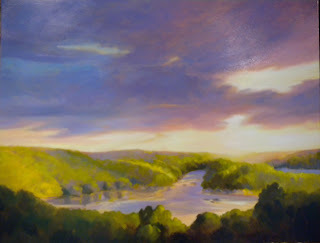 I am on the Virginia side of the Potomac looking towards Maryland and right around that bend is one of my favorite painting locals, Wide Water. You would have seen those paintings from the beach at Wide Water if you read my posts last October. Actually what you are seeing in the background of those paintings is that island to the right. Usually I show you the paintings as they progress but this time I will work backwards instead. The image below is of the painting the first day I started adding color. Second day of work on "May Morning...."
First day of work on "May Morning...."
Here is the start up. To the left, sitting on top of the large painting is the plein air painting I did last October from this site above the Potomac. I used this painting as my study for the larger, 24x30 painting on linen. I prefer to paint the season I am in. It feels strange to do otherwise. I used what I know about this site as well as what I can see just outside the studio windows to create an early May morning. Above the painting on the easel is a drawing made from the plein air study where I made some adjustments such as eliminating the tall, decaying underbrush that appears in the plein air piece. I have also done the sketch on graph paper which gives me an easy reference for placement of forms on the canvas. 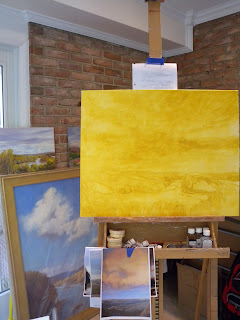 I used yellow ochre as the underpainting and sketched the scene in with my brush and darker ochre. Taped to the easel are images of earlier paintings I have done from this place just to give me more reference material. From here I moved on to the above.